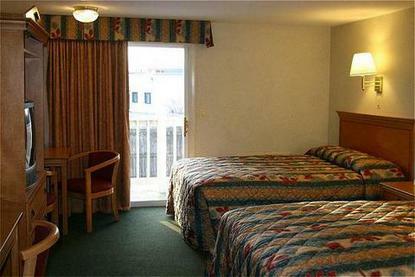 The Hyannis Travel Inn is a 83-room modern motel and is ideally situated in the heart of Hyannis MA. Our lodging in the /Hub of Cape Cod/ is within walking distance of many Hyannis activities including shopping- dining- sports- recreation- cultural attractions and the beautiful Cape Cod harbor. Our lodging has tastefully appointed rooms with all the comforts of home so you can relax and enjoy your stay. Each room features cable TV- individual heat/air conditioning- two double beds /some rooms have larger beds/ and an individual balcony or porch. Guests will also enjoy the convenience of an in-room refrigerator- an iron and ironing board- hairdryer- and free local calls. Our motel has interior corridors- and offers complimentary continental breakfast- coffee and tea all day- wi-fi access and free on-site parking. Whether you want to explore Cape Cod with that special someone or spend quality time with the kids our motel lets you relax and enjoy your vacation. Stroll over to our heated indoor pool for some splashing fun- enjoy the sun by our outdoor pool- or take a soak in the oversized whirlpool. After a glorious daytrip to Martha*s Vineyard or Nantucket unwind in the sauna. Best of all our Cape Cod hotel offers the warm hospitality that makes guests feel welcomed.